Six-foot-eight social media star and bodybuilding freak Martyn Ford has signed with a pro MMA organization. According to the Englishman, he’ll be making his professional fighting debut early 2019 under the KSW banner. Konfrontacja Sztuk Walki announced the signing at their KSW 45 event at Wembley Arena, England. Ford cut an imposing figure as he stepped into the cage shadowing the show’s presenter. He then took the mic to tell the fans that he’ll be trying his hand at professional fighting. According to Ford, he’ll be fulfilling a lifelong dream of becoming a combat star too. Ford doesn’t have any professional martial arts experience, with a record of 0-0. 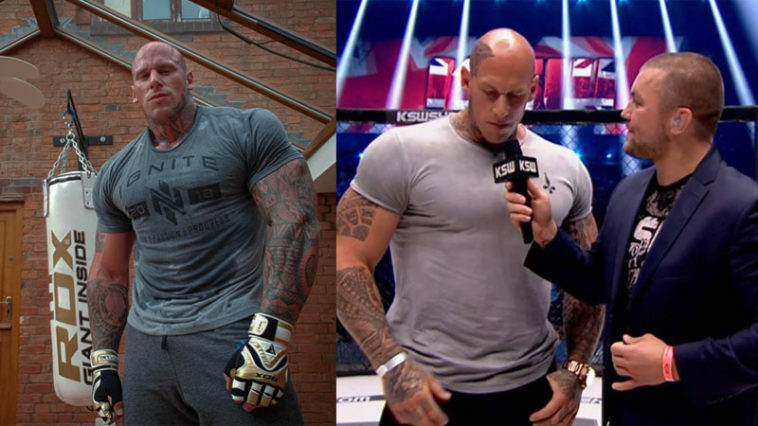 However, his combat roles in movies alongside a 1.4 million following on Instagram make him a smart signing for KSW. Not only will he bring thousands of new fans, but The Nightmare’s hulking figure will make for awesome freakshow fights. Because of his gigantic 320 lb frame, Martyn will most likely compete in the Super Heavyweight class with other behemoth men. KSW’s notoriety for signing giants based purely on popularity hasn’t gone unnoticed. Many fans and journalist say it is reminiscent of the once great PRIDE FC of Japan, who dominated the earlier days of MMA with their crazy match ups. The Japanese organization was infamous for ‘freakshow fights’, which saw huge men battling it out regardless of skill. Whilst KSW might never live up to the legacy of PRIDE they know someone of Ford’s size is sure to draw attention. Revenue-wise he’s a gigantic muscular goldmine. Can ‘The Nightmare’ Transition to Fighting? Now, we must be patient and see how the social media star transitions his training. Can he switch up the bodybuilding sessions for combat cardio, or will his insane muscle mass hold him back? There’s one thing for sure though, we can’t wait to find out! Let us know what you think, bro.